A window has been opened on France’s sophisticated, elegant gastronomy following recent conversations between Tuoi Tre (Youth) newspaper and two chefs in Ho Chi Minh City who will take part in a special event to honor French cuisine next week. Nguyen Manh Phuc, the chef and owner of Le Bordeaux Restaurant, located in the city’s Binh Thanh District, and Sakal Phoeung, a French chef of L’Olivier Restaurant belonging to the famous Sofitel Saigon Plaza, are poised to join 15 Vietnamese and French cooks in “Goût de France/Good France,” a special event to honor French cuisine. The event is scheduled to take place simultaneously at over 1,300 restaurants in 150 countries and territories on March 19, French Ambassador to Vietnam Jean-Noël Poirier announced on Wednesday. Alongside the 17 chefs who work at restaurants and hotels in Hanoi, Ho Chi Minh City, Thua Thien-Hue Province, Da Nang, and Quang Nam Province, two renowned French chefs, Raphael le Mancq and Xavier Mathieu, will arrive in Vietnam and join the event at the French Embassy and Consulate General in the capital and Ho Chi Minh City. “‘Goût de France,’ which is well supported by the French government and Alain Ducasse – one of the world’s most respected chefs – helps better promote the sophisticated, refined French gastronomy. The event is thus enthusiastically applauded by chefs the world over, including Vietnam,” Phoeung observed. Phuc, the chef and owner of Le Bordeaux Restaurant, is an established practitioner of French cuisine. After years of serving as an apprentice under some of the world’s most revered masterchefs and working at famous restaurants in Bordeaux, France, Phuc returned to his home country in the early 1990s. After some procrastination, he opened his restaurant, Le Bordeaux, in April 1996 and the eatery served around 50-60 clients a day. Over the past 19 years, the restaurant has appealed greatly to a large number of local gourmets on account of his diverse menus of delectable French dishes, a part from receiving delegations of foreign diplomats. “The best dishes accentuate simplicity. If the ingredients themselves are of premium quality, just let them shine with almost no need for spices or condiments,” Phuc told Tuoi Tre about his philosophy, inspired by what French chef Alain Passard said in 2005. Phuc is thus particular about the choice of ingredients for his dishes. “For instance, when it comes to the use of saffron, I generally choose the one from pistils instead of conventional bulbs. In my opinion, several local ingredients such as raspberries or certain veggies grown in Da Lat [the capital city of Lam Dong Province in the Central Highlands region] can go well with exotic ones in haute cuisine recipes, but not all can do that well,” he underscored. 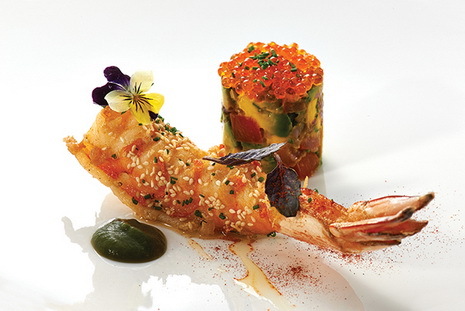 He orders most of his ingredients from Classic Fine Foods, one of the world’s leading importers and distributors of fine food which serves the vast majority of five-star hotels and high-end restaurants in Asia and Europe. The veteran cook said that the key to the success of his own restaurant and others specialized in French cuisine in Ho Chi Minh City are mostly premium quality, good service, and reasonable prices. Many luxury restaurants located in auspicious positions are considerably less crowded and appealing than smaller shops in alleys, he observed. Meanwhile, Phoeung – Phuc’s colleague of French nationality – always makes sure Vietnamese products account for between 75 and 80 percent of his materials. Phoeung, who has worked at Sofitel Saigon Plaza for some 11 years, pays close attention to French gastronomy’s authenticity. “Authenticity is also about traditionality. We chefs always accord respect to fundamental recipes acquired at school or from predecessors. However, there’s always room for creativity,” he noted. Phoeung stressed creativity should not stray from traditionality. “For instance, I do not favor the idea of fusing dishes from different gastronomic cultures, as it’s not easy to be in full control of all the ingredients. I often use Vietnamese materials for my French dishes and make sure their authentic and original flavors and styles are always respected,” he underlined. Phoeung works closely with farm owners in Da Lat, who supply him with safe, quality French-origin veggies and spices. The seasoned chef pointed out one striking difference between Vietnamese and French ingredients. “Raw materials are very much the same during ten months of the year in Vietnam, while France’s four vastly different seasons allow chefs easy access to a wide array of seasonal products. It requires more aromatic herbs and spices for French dishes to be prepared in Vietnam, while it’s usually not the case for those cooked in France,” he stressed. In addition, certain adaptations are made to tailor French dishes to the Vietnamese taste and Vietnam’s hot climate, such as replacing cream and milk with olive oil and vinegar. French gastronomy is not only about haute cuisine but also about less extravagant dishes which people from different walks of life can bask in, Phoeung said.